Few animals are as familiar and yet mysterious as the humble frog, able to live on land, yet disappearing into the muddy depths of a winter pond for months at a time, sometimes surviving freezing temperatures, and emerging again in spring apparently unharmed. Frogs can live on land and cope with spending large amounts of time in mud underwater by breathing through their lungs, mouth and skin, and some frogs even have the ability to stop breathing altogether. Frogs can absorb oxygen in their lungs, the roofs of their mouths and through blood vessels in their skin. Lacking ribs and a diaphragm to reduce the air pressure in their lungs, they lower the floors of their mouths instead, and open their throats and nostrils to allow air to move into their lungs. At the same time, oxygen also enters their blood through a respiratory surface on the roofs of their mouths. Their thin, moist skin can absorb oxygen from air and water. When covered in mud at the bottom of pools, frogs absorb oxygen through their skin from water in the mud. When frogs hibernate in ponds in winter, they spend months at a time in mud underwater and only surface occasionally to breathe. They need oxygen-rich water to do this, and sometimes move around to maintain a sufficient level, but also, as temperatures cool, frogs' oxygen needs reduce because their metabolism slows down. Most of their blood moves to their skin to maximize the amount of oxygen absorbed, which can sometimes be observed when the light skin on their bellies turns pink from the increased blood flow. In this state, frogs can survive for long periods of time without returning to the air. Some frog species freeze during hibernation, stop breathing and stop their hearts beating. The wood frog (Rana sylvatica) can survive a body temperature as low as 21 degrees Fahrenheit, with 60 to 70 percent of its body fluids frozen. Its blood contains specific proteins that help prevent the damaging effects of freezing, and its liver releases large amounts of glucose that acts like antifreeze, protecting the frog's vital organs. The wood frog can survive up to a month in this state without permanent damage. When temperatures rise, it thaws and its breathing and heart function resume. 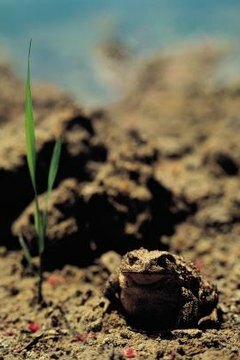 Frogs hibernating in mud show other physical and behavioral changes as well as altered breathing patterns. To protect their eyes from damage from mud and debris in the water, they cover them with a transparent membrane and pull them closer into their heads. Frogs also change their posture to a splayed form, with all four legs flat against the pond floor, to help maintain stability, and they become much less active, even appearing to be dead.